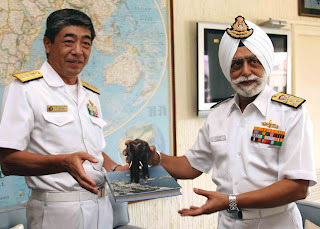 Japanese Maritime Self Defence Force Training Squadron (JTS) comprising Japanese ships Kashima, Asagiri and Umigiri arrived at Mumbai Port on four day visit on Saturday, 23 Aug 08. 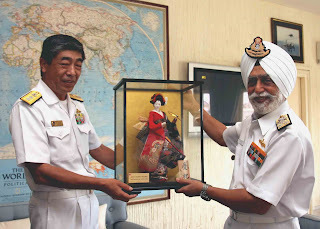 Rear Admiral Chikara Inoue, Commander Japan Training Squadron (JTS) accompanied by staff visited the Headquarters Western Naval Command today where he was received by Vice Admiral Jagjit Singh Bedi, Flag Officer Commanding-in-Chief, Western Naval Command. The two senior officers had discussions on various issues related with the two navies. India established diplomatic relations with Japan in 1952 and the two countries have maintained cordial relations ever since.